ON DISPLAY at The Newport Brokerage Show: September 13th-16th FOR SALE BY HER ORIGINAL OWNER "Strella Encore" is a beautifully maintained, semi-custom Hylas 54. Because her owners had planned to do some long distance offshore cruising and racing, she was built to comply with the Offshore Racing Council (ORC) specifications and safety requirements: "Yachts must be completely self-sufficient for very extended periods of time, capable of withstanding heavy storms and prepared to meet a serious emergency without the expectation of outside assistance." She is fully equipped with everything from a Leisurefurl Boom to a Side Power Bow Thruster. New Awlgrip on hull in March 2018. United Yacht Sales New Jersey would love to guide you through a personal showing of this 54' Hylas 54 Deck Salon 2000. 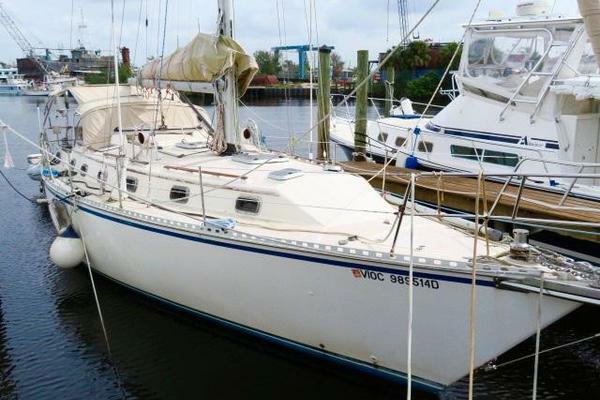 This yacht for sale is located in Sag Harbor, New York and priced at $475,000. For a showing please contact us by filling out the form on this page and we will get back to you shortly! Forward Stateroom:Forward berth was moved to the port side hull, raised to accommodate more stowage, with 60" of width at the head of the berth.Hinged opening beneath the forward mattress for ease of access. Folding step to help access to berth, hanging lockers, deep lockers, and bookshelf. Lee cloth.